Driven by the soaring sales of products including the iPad and the iPhone 4, Apple’s shipments of products based on its A4 microprocessor reached nearly 50 million units in 2010 from virtually zero sales in 2009, IHS iSuppli research indicates. Building on the success of its A4 microprocessor, Apple recently announced that its second-generation iPad line will be based on a new microprocessor, the A5, which the company said doubles the performance of the A4. 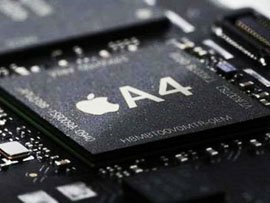 Apple said the A5 will include dual microprocessor cores, compared to a single core for the A4. Along with the rise in computing power, Apple said the A5 will offer nine times faster graphics performance than the A4. 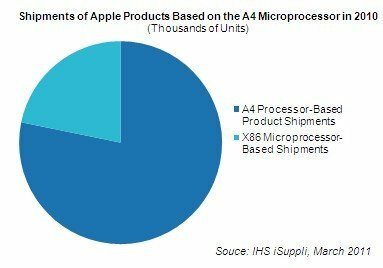 In an indication of how successful the microprocessor has been, Apple in 2010 shipped nearly four times as many units of A4-based products as it did of X86-based . According to the analysts, the low-cost, highly integrated A4 and A5 designs represent an important element in Apple’s philosophy of offering products focused on delivering a compelling user interface (UI) and a greatly optimized computing platform for Apple’s iOS operating system. "In the new design paradigm of smart phones and tablets, computing efficiency trumps raw computing power. Designs like the iPad demand highly integrated microprocessors that emphasize graphics performance, lower power consumption and small space usage," Wayne Lam, Senior Analyst at iSuppli. Apple so far has introduced five products based on the A4: the first-generation iPad, the AT&T version of the iPhone 4, the Apple TV, the iPod Touch and the CDMA iPhone 4 carried by Verizon Wireless. The A4 combines an A4 microprocessor core and a graphics processing unit (GPU). The device was custom designed by P.A. Semi—a company acquired by Apple in 2008—and is manufactured by Samsung Electronics Co. Partly because of the popularity of Apple’s iPad, companies around the world are developing media tablets and other products that feature small and innovative form factors. These products require highly integrated semiconductor solutions that consume less power and space, similar to the A4 microprocessor. "In the PC market, this trend is driving rising sales of notebook microprocessors that integrate graphics processing capabilities, eliminating the need for separate GPUs," said Lam. In tablets and smart phones, companies are offering alternatives to the A4 that provide similar levels of integration. For instance, Intel and Nvidia have announced plans for tablet-oriented microprocessors with similar characteristics to the A4.